Outside Magazine released their list of Most Influential Gear of All Time. Lots of interesting stuff on the list with many directly or indirectly related to cycling. There are surely items on the list that many disagree with and ones that are missing, but the list is interesting overall and definitely listed so things everyone probably would agree should be on there. I've pulled out the bike related items below with a few comments. The Safety Bike - This is where is all began, the 2 wheel design that still lives on today. Campagnolo Bicycle Components - First the quick release, then the derailleur. Still making highly sought after parts. Thule Roof Rack - Gear hauling on your roof. Smart and functional. DuPont Spandex - You can't get away from this stuff when looking for cycling apparel. Making good bodies look good and bad bodies look really bad. Kryptonite U-Lock - The one that set the standard for tough bicycle locks and spawned dozens of imitators. Bell Bicycle Helmet - Sure, hair net helmets look retro cool, but the styrofoam Bell spawned the beginning of modern bicycle helmet design that continues today. Schwinn Stingray BMX Bike - For me, BMX and freestyle was the path that eventually led to MTB. Make sure to check out The History of Mongoose. Gary Fisher Mountain Bikes - Some may argue who invented the mountain bike, but there is no doubt Fisher and the company he founded were key in making this sport as big as it is today. Specialized Stumpjumper - Copied from an early Tom Ritchey design, the Stumpjumper was mass-produced overseas and brought mountain biking to the masses and set up the model for future MTB production. Polar Wireless Heart Rate Monitor - Way to geeky for me, but hear rate monitors definitely changed the game for serious athletes, many of them the cyclist riding next to you emitting weird beeps when you decide to attack and drive the pace. Manhattan Portage Messenger Bag - Messenger bags weren't invented by these guys, they've been around a lot longer than modern times, but there is no doubt the basic design and bomb-proof construction that evolved has been a big deal for everyone from professional bike messengers to bike geeks wanting a solid way to carry big loads on 2 wheels. Look Clipless Pedals - Sure, some people ride flat pedals and some people still rock toe clips and straps, but most serious cyclists use clipless pedals at least some of the time and with good reason: there are plenty of benefits. Look started it all. 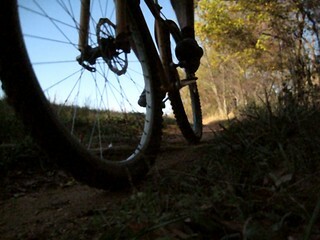 The Helmet Cam - A picture is worth a thousand words, but how many words is a video of mountain biking worth. GoPro has refined this idea, but the original helmet cam was invented by a mountain biker using what is now old school video camera technology. The Handheld GPS - The unit shown here isn't bike friendly, but making these devices smaller and at a consumer price point has changed both mountain biking and road biking. Some people ride with one every single time they go for a spin. Overkill maybe, but no doubt it's great to have a GPS when deep in the woods in unfamiliar territory. Powerbar - Portable food with the right blend of nutrition for athletes. The original Powerbar sure doesn't look that appetizing compared to the latest offerings, but it wasn't terrible and served a great purpose which then drove us to the tasty, on-the-bike foods we have today. Rock Shox RS1 - Suspension: taking cues from the moto world this component revolutionized mountain biking. Without this the craziness and mind-blowing tricks pulled at events like the Redbull Rampage would not have been possible. Camelbak - Deep back country and long distance riding options really opened up with the invention of the Camelbak. Hauling huge amounts of water means less need to find water on your route and opens your possibilities. Smart Wool Socks - Wool is a great material, Smartwool made socks and clothing that made people forget their ideas that wool had to be scratchy and uncomfortable. Dupont took us to the synthetics, Smartwool brought us back to the natural fibers. Gary Fisher 29er - Fisher made the list twice. He didn't invent the 29er, but he pushed the idea and helped make sure it gained traction by spec-ing tires and suspension forks for his mass produced bikes, two critical components that were lacking and needed to push the 29er idea forward.